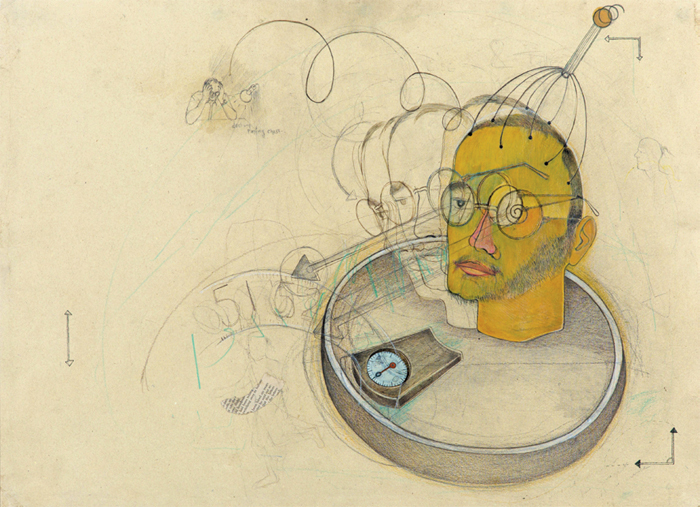 Roshan Chhabria, Weight of a Brain (detail), 2013, watercolor on paper, 22 1/2 x 31". “Just what is it,” asked Roshan Chhabria via cut-up text pasted on a wall in his debut solo exhibition, “that makes today’s Mothers so different so appealing?” Just above this cheeky questiona revised quotation from Richard Hamiltonwere three graphite-and-watercolor drawings, all dated 2011, depicting an upper-middle-class Indian housewife engaged in stereotypical activities. She works out with a personal trainer. She lounges in bed watching a soap opera while instructing a servant. In a pink-and-ocher dress and with two children in tow, she plods down the runway of a “mother and children’s fashion show competition,” presumably at one of the country’s new malls.